Recently, Leah and Sonia shared their design goals for 2018. This week, I'll be sharing one of the rooms from my home that I’ve been wanting to makeover for quite some time--the laundry room! Isn’t it funny how a room we use almost every day doing one of the most dreaded chores gets pushed aside to the bottom of our wishlist? This year, I'm finally taking control and making this a room that makes me want to do multiple loads of laundry and iron like nobody’s business! While I'm thankful to have an actual room for our laundry near the kitchen, it is a room that guests walk by and see when they use our powder room right next to it. If we are having company over, I need to make sure there’s not a mound of laundry on the floor, undergarments drying on a rack, or shoes piling up from the garage entrance also off this room. Luckily, there's a pocket door for emergencies (smart thinking of the previous owners of our home). However, the laundry room also has a window that gives off a lot of natural light into the otherwise dark hallway so closing the pocket door is not always ideal. Along with the clutter, there is also a not-so-pretty wire shelving unit that is visible on the way to the powder room that is really not necessary since there are plenty of cabinets above and beside the washer/dryer on the opposite wall. My goal is to replace the wire shelving unit with a long open counter top for folding clothes with a couple of rolling laundry carts underneath and some type of concealed shelving for extra shoes. A nice light fixture and a fresh coat of paint on the walls and cabinets would really transform this room and make it a place I look forward to using every day (and not embarrassed by from all the clutter when guests walk by). I love the turned legs and butcher block countertop along with some simple white subway tile to go along with the rest of the farmhouse style in my home. What’s better than white shiplap to add some texture to an accent wall? I love the gray tiled floor in this pattern in this room too! I am thinking of painting the existing white cabinets a beautiful shade of navy or gray to add some contrast and interest to my mostly neutral home. Love how darker paint colors can make such a statement against so much white! Hope to have some updates for you later in 2018! Last week, Leah revealed her 2018 design goal and this week I'm up! If you've ever heard the old saying that it's the shoemakers children that always go barefoot, the same holds true for designers, our homes are not immune to spaces that need some design lovin'. This year I'm on a mission to update my home office. Over the past year our office has become a landing spot for packages awaiting their return, random baby gear and a load of unorganized papers. This year my goal is to update my home office, so over the past few weeks I've been pinning away and developing a plan. On the bright side, it has lots of windows and gets amazing natural light. It's also a decent sized room and has some nice storage options. All major pluses. It's a great space, it's just a matter of making it work for our changing needs and updating the general aesthetic. Below are some initial ideas I've gravitated toward. You'll see deep blues, brass, dark gray and wood tones, neutral rugs, and two person working stations. January is a great time for resolution making. It's also a great time for design goal making. If it's not completely obvious, design goals are goals you have to update/renovate/transform your house. And it doesn't have to be your whole house, in fact that would be a totally unrealistic, stress-inducing, setting-yourself-up-to-fail goal. Instead, the idea is to pick something narrow and achievable. Successfully meeting any goal leads to more goal making and more goal achieving. With the blog to keep us honest, Sonia, Michele and I are all going to reveal our 2018 design goals to you over the next couple weeks. Because we don't just design and transform other people's homes, we are constantly working on the transformation of our own homes. And we fully expect you to question us, remind us (and even berate us for procrastination) as the year plays out and (hopefully) our goals become reality. I'm up first and I'm really excited about my goal because it really needs to be achieved. Here it is: CLOSET ORGANIZATION. The inside of my closets are not just eyesores that lack any semblance of function. They are truly dangerous. Opening my cleaning supply closet will almost definitely result in a concussion as a mop handle swings at your dome. My linen closet is partially full of bottled water. Hmmmm...take that one in. My basement storage closets, which I'm very lucky to have, are full of things...things I can't tell you about because I don't know. 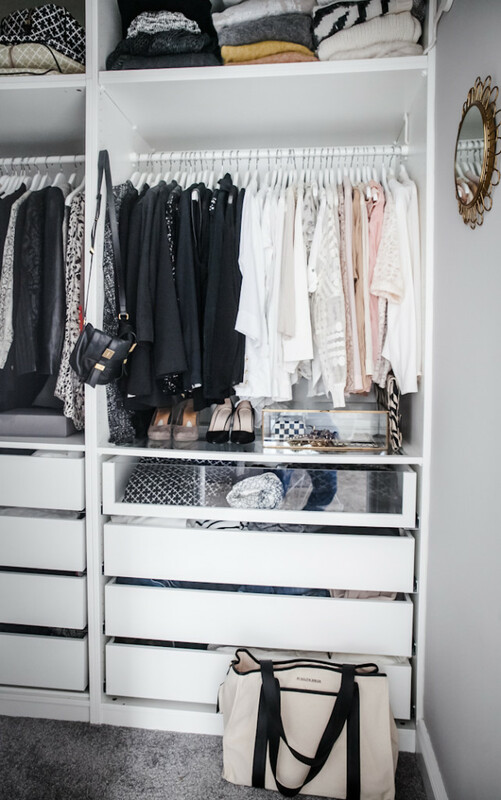 These closets are so completely disorganized there's truly no telling what's in them. I won't even attempt to describe the state of my clothing closet or garage. So, my design goal is really a design necessity. Now for the fun part - my inspiration, so far. That's a magical linen closet. It's not so big. But, manages to look beautiful without skimping on use of a single inch. I love this closet. My own closet is a small walk-in that I share with my husband. It has a window, which is awesome for the natural light, but not awesome for the wall real estate it takes away. Function will be top priority here because a heap of shoes in the middle of the closet floor isn't working out so well. As a general inspiration, I'm turning to The Home Edit (I'm a huge fan). The Home Edit is an organization company that has designed the closets, pantries, etc. of major celebs - like Gwyneth Paltrow. Apparently Gwyneth has more than one pantry. Of course. Anyway, it's completely ironic that I'm a huge fan of The Home Edit because I have harnessed absolutely none of the organization power they bestow on their followers. Until now. Until 2018. Get ready mop in my cleaning closet, you're about to get properly secured to the wall.